As future HPC systems become larger, the failure rates and the cost of checkpointing to the global file system are expected to increase. Hierarchical incremental CPR is a promising approach to solve this problem. It utilizes a hierarchical storage system of local and global storages and performs incremental checkpointing by writing only updated memory pages between two consecutive checkpoints. In this paper, we response to an open question; how to optimize the checkpoint interval when the checkpoint overheads are changing with time as in hierarchical incremental CPR. We propose a runtime checkpoint interval autotuning technique to optimize the efficiency of hierarchical incremental CPR. Evaluation results show that the efficiency can be significantly increased if the storage hierarchy can be exploited with appropriate checkpoint intervals. 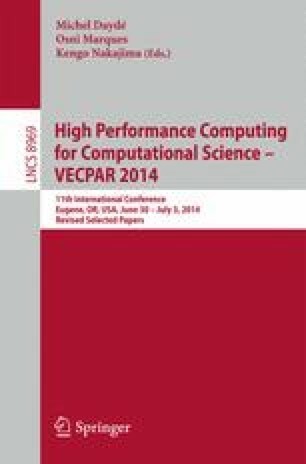 This research is partially supported by JST CREST “An Evolutionary Approach to Construction of a Software Development Environment for Massively-Parallel Heterogeneous Systems” and Grant-in-Aid for Scientific Research(B) #25280041. The first author, Alfian Amrizal, is financially supported by Monbukagakusho.